(Nanowerk News) Scientists at the U.S. Naval Research Laboratory (NRL) discovered a new method to passivate defects in next generation optical materials to improve optical quality and enable the miniaturization of light emitting diodes and other optical elements. 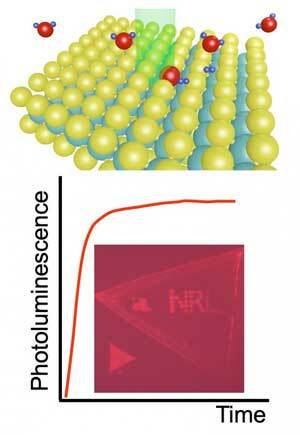 "From a chemistry standpoint, we have discovered a new photocatalytic reaction using laser light and water molecules, which is new and exciting," said Saujan Sivaram, Ph.D., lead author of the study (ACS Applied Materials & Interfaces, "Spatially Selective Enhancement of Photoluminescence in MoS2 by Exciton-Mediated Adsorption and Defect Passivation"). "From a general perspective, this work enables the integration of high quality, optically active, atomically thin material in a variety of applications, such as electronics, electro-catalysts, memory, and quantum computing applications."